This is the second instalment of the Dawn space trilogy. If you haven’t seen the first part yet, you may want to read that first. The region was known to be peculiar. The ground around the German town of Nordlingen contained strange rocks – the houses were build from them. Geologists had decided that it had been the site of a massive volcano. But in the 1960’s, doubts crept in. Eugene Shoemaker first called it an impact crater. It took decades before that view became accepted, with dissenting papers being published as late as this century. In the end the evidence became indisputable. The wealthy heart of Europe has been hiding, unrecognized, the largest impact crater west of the Volga (the Puchezh-Katunki crater just east of the Volga is larger). The Nordlinger Ries, as it is now known, is 26 kilometers across with a rim 200 meters high. The interior is flat: there is no central rise, probably because the impact made the interior melt. Over the years, much of the rim has been quarried. The quarries are now a geology park: they reveal the geology nice and obvious. One thing they show is the sheer violence of the impact. One of the quarries mined an overturned block, with all the strata still in place but inverted. The block is a cubic kilometer in size and was thrown over a distance of at least 7 kilometers! The ejecta of the impact blanketed the ground 50 kilometers away. Nordlingen, Southern Germany. The town is build in and from an impact crater. The rock used is embedded with micro-diamonds which formed in the shock of the impact, each a fraction of a mm across. The builders never knew! The impactor that created the crater is estimated at 1.5 kilometer in size. Interestingly, this is about the size of the red-roofed, walled town of Nordlingen itself. The impactor was a stony asteroid which had been ejected from the asteroid belt, probably by the gravity of Jupiter, into an orbit that intersected that of the Earth. Each time the orbits crossed, the Earth wasn’t there. But finally, after perhaps a billion years and hundreds of millions of misses, luck ran out 15 million years ago. The asteroid tried to pass, but this time the rim of the Earth was in the way and an impact became unavoidable. The Nordlingen impact must have shaken all of Europe. And it didn’t come alone. It turned out that the asteroid had a small moon, 150 meters across. That too hit the Earth, and caused a crater 42 kilometers away, towards Stuttgart: this formed the 4-kilometer wide Steinheimer Basin. Further east, the moldavite fields of Bohemia and Lower Austria were formed during the same double impact event. The impactor that formed the Riess crater is classified as an achondrite. This is an obscure type of meteorite, which consists of basaltic (or plutonic) rock. Chondrites are meteorites that still contain the nodules from which they first formed, in space. Achondrites do not have that: they were metamorphosed. No space rock should do that. To get basalt, you need to melt rock and let the molten mass come up. That requires a reasonable large body, otherwise there is not enough heat to cause melt. It must have well over 100 kilometer across. About 8% of asteroid impacts are by achondrites. Meteorites can sometimes be traced back to their origin. A big impact can dislodge rocks with such violence that even on a small planet, some fragments can reach escape velocity. Several meteorites are known to have come from Mars. One of them famously was claimed to show evidence for past life on Mars. (That evidence is not currently accepted.) Quite a few meteorites are known to come from the Moon. Meteorite hunters/scientists may spend the summer on the Antarctic icecap to search for them: the dark colour makes them stand out against the white ice. This allows us to study the composition of objects we can not (or can no longer) reach directly. NASA, though, prefers to collect its evidence in situ rather than second-hand from Earth. Two thirds of the known achrondrites (5% of all meteorites on Earth) have orbits that are similar to each other: They seem to be debris from the same original asteroid. The orbits point at Vesta as the origin, and that is now commonly accepted. The Vestan achondrites form three distinct families, called the howardites, the eucrites and the diogenites. Together they are called, with all the imagery the scientific language can muster, the HEDs. There are quite a number of such asteroid families, where objects have orbits that indicate a shared origin. Most members of a family look identical, with the same colour and composition. This is not the case for the HEDs, where each of the three related families show distinctive colours and composition. Eucrites are basaltic, effectively solidified lava. Diogenites are solidified magma (plutonic), i.e. which cooled slowly underground allowing crystals to form. Howardites are intermediate, with aspects of the two. If all three came from the same body (Vesta), that body has some interesting geology – and that includes volcanic activity. It is worth a close look. We knew quite a bit about Vesta even before the Dawn space probe came to visit. In common with all but one of the asteroids Vesta is distinctly not round. (Only Ceres is round.) Vesta has a size of 573 km along the equator but only 446 km between the poles. The shape has been compared to a giant walnut. Vesta is a fast rotator, with a period of 5.3 hours. The density is 3500 kg/m3, higher than that of pure rock, and much higher than ice. This density already shows that Vesta is a rocky body, with a significant amount of metal (iron) thrown in to bring the average density up. This composition is similar to that of the terrestrial planets, and very different from the icy moons of the outer solar system. Vesta clearly belongs to the inner solar system. The location also says so: it is orbiting near the inner edge of the main asteroid belt, much closer to Mars than Jupiter. But it is not a planet, not even a dwarf planet. It missed out because it lacks roundness. It has too much character. Dawn arrived at Vesta in mid 2011 and spend just over a year exploring the world, finally escaping back into space in September 2012. The exploration was mainly divided between two orbits, one at 700 km above the surface and one at 200 km. The images showed more details of the shape. In the southern hemisphere of Vesta, even from a considerable distance it revealed two large, overlapping depressions. Both are circular and appear consistent with impact craters. The largest of the two had already been seen by the Hubble Space Telescope, and is now called Rheasilvia. It is an impressive crater by any standard, but especially so on the small body of Vesta. Rheasilvia has a diameter of 500 km, equal to 1/6th of the circumference of Vesta! 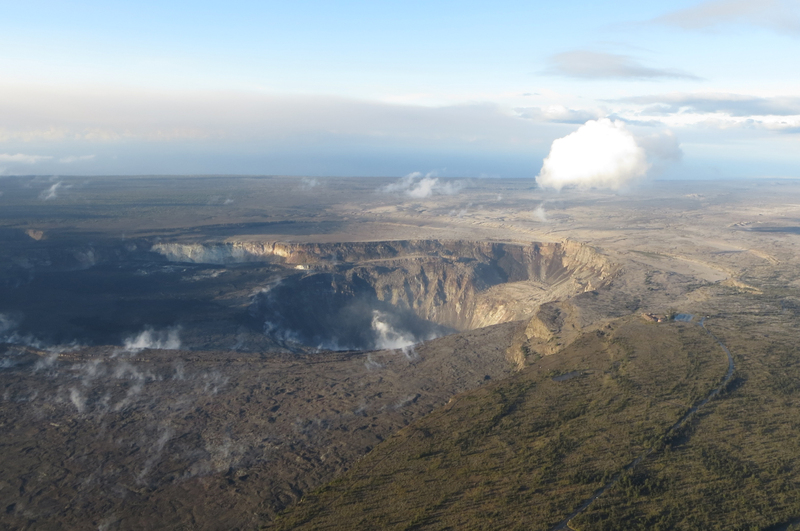 The rim is as much as 19 kilometer above the crater floor. The biggest surprise was the central peak, discovered by Dawn. It is a staggering 200 kilometers across, and 22 kilometer tall; it is one of of the tallest mountains in the solar system. And Dawn found a second crater, partially obliterated by Rheasilvia. This is called Veneneia, is 400 kilometer across, and 12 kilometer deep. From crater counts inside the basin, Rheasilvia is estimated to be 1 billion years old. Veneneia is probably twice as old. At Vesta, lightning did strike in the same place twice. The Rheasilvia impact excavated 1% of Vesta’s mass. This impact is the most likely source of the HED meteorites, and perhaps led to the double impact in Germany, 15 million years ago. This would mean that 5% of all current meteorite impacts on Earth can be traced back to a single event in the solar system, 200 million kilometers away and a billion years ago! The movie below was made by stitching together lots of separate images from Dawn, taken over an extended period. Rheasilvia is visible at the bottom. The profile shows how much of Vesta is missing because of the crater: the walnut shape is in part because of the missing south. The central mountain, Rheasilvia Mons, is a notable bump in the profile. Dawn found another peculiar feature: a set of grooves stretching out around the equator. We do not know how they formed but the structures are similar to grabens on Earth. And they are huge. The largest one, Divalia Fossa, is 465 kilometers long, 22 km wide and 5 km deep, and comfortably dwarfs the Grand Canyon. There are in fact two sets of grooves, with slightly different orientations. The clearest ones are equatorial, and centred on Rheasilvia: these appear related to that impact. The second set is less clear and appears older: they are centred on Veneneia. Equatorial (white) and northern (red) troughs on Vesta. The center positions of the trough sets correspond to the center of Rheasilvia (white ×) and Veneneia (red ×), respectively. From Jaumann et al. (2012, Science 336, 687–690). A graben signals a local extension of the crust: there is not enough crust available for the extension, and holes develop in which the top layer drops down. Imagine what would happen to your roof if the walls of your house would move a little further apart. It is not immediately clear though how a major impact can cause extension. Perhaps the shock of the impact could have pushed the equator outward. It has also been suggested that the impact caused Vesta to rotate faster, and thereby develop an equatorial bulge. At least 10 other craters are more than 50 kilometers in diameter. The largest of these is 250 km across, and is also partly covered by Rheasilvia. Most of the craters are in the northern hemisphere, where the oldest surface is found. This old surface was obliterated in the south by the two large impacts. Note that the north pole is not covered by the images. Dawn was in orbit only during the southern summer – the north pole was in perpetual darkness. So there could still be more surprises waiting. Dawn measured both the size and the mass of Vesta. It found that Vesta is not the largest asteroid (not including the dwarf planet Ceres). By volume, Pallas appears just a tad larger. But Vesta is heavier than Pallas. It must therefore have a higher density. Indeed, the density of Vesta is measured at 3456 kg/m3 which is considerably higher than that of typical rocky asteroids. Many asteroids are quite porous: rubble piles with holes in between. Vesta, in contrast is solid rock. But Vesta must also have a high density core. From the Dawn data, the core is estimated at 110-130 km diameter, containing around 20% of Vesta’s mass. The core is metallic: iron and nickel, with possibly some sulphur. Dawn showed that the surface of Vesta is very similar to that of the howardites. The surface is not entirely homogeneous. Two small terrains at the base of the Rheasilvia central uplift and on a scarp of the Rheasilvia Basin called Matronalia Rupes fall within the diogenite-rich end of the range of HED meteorites. The oldest terrains are closer in composition to eucrite. The fact that all three kind of HEDs have counterparts on Vesta makes it very likely that indeed this is where they came from. What happened? To create a metal core requires differentiation: a process that separates rock from iron, as happened on the rocky planets. The only process that can do this in a reasonable amount of time is melting. Vesta must have had magma. We now believe that Vesta formed very early on, and reached something near its current size within a few million years after the formation of the Solar System. That rapid formation is important. Just before the solar system formed, a nearby supernova had ejected a large amount of radioactive aluminium (Al-26), and this became incorporated in the material from which the solar system formed. The aluminium decayed quite quickly (the half time of Al-26 is 720,000 years), and within a few million years it was gone. But in the mean time, its radioactivity produced heat. Vesta contained radioactive aluminium, and the heat could not get out quickly enough. Inside, the newly formed body began to melt. Iron melts at a temperature of 1250 K. Silicate rock (if dry) melts at slightly higher temperature, around 1320 K. As the heat grew, iron began to melt. Being denser than the surrounding rock, it slowly dripped down through any cracks it could find. The process speeded up once the silicate rock melted as well. Quickly an iron core formed, surrounded by a magma ocean, in turn covered by a thick solid crust. Cracks in the crust allowed magma to reach the surface. The entire surface became volcanic basalt, a mini Venus. By now, the Solar System was still only 3 million years old! But the aluminum-26 decayed and soon disappeared, and Vesta began to cool down and solidify. Now it had a basaltic surface, an olivine mantle, and an iron core. Within 100 million years after the starting gun, all heat was gone and Vesta was geologically dead. The planets had barely finished forming at this time. In the next phase, collisions became important. Some bodies which had gone through the same evolution, were smashed to bits. The fragments gave rise to a huge variety of smaller asteroids, with different compositions: some rocky, some metallic – the latter came from disrupted cores. Vesta escaped and remained relatively unscathed, although it did lose quite a bit of its basaltic crust, including any volcanic peaks that might have formed. It may have lost as much as 10 kilometers from its surface. And twice, it was hit by large fragments that did extensive damage. But in spite of the bombardment, the crust survived, and the mantle and core remained hidden below. Other objects were not so lucky. The asteroid Psyche is an example. It is a metallic object, 200 kilometers across. Originally it may have been similar to Vesta, but collisions removed its crust and mantle, and exposed the iron core. It is one of strangest worlds we know – and could be worth a fortune to the adventurous miner (in case Elon Musk is reading this). In the inner Solar System, the planetesimals kept growing, and became Mars-sized proto-planets. In the asteroid belt there was never enough mass for that. Here, the planetesimals stopped growing, with few reaching over 500 km. Vesta may always have been one of the largest ones in the asteroid belt. Not all grew at the same rate. The ones that grew slower than Vesta left it too late: not enough heat was left to melt them. These never differentiated and did not form an iron core. Others were too small and could not retain enough heat. A few must have been like Vesta. How many we will never know for certain. But a number of iron meteorites are known, and from their isotopes we know they came from different bodies. They indicate that between 23 and 60 different iron cores were smashed up. And there must have been ones we don’t know about. We can guess that there were perhaps 100 asteroids similar to Vesta. But the survival rate of asteroids was very low. Some were thrown out, often after getting too close to newly formed Jupiter, and ended up colliding with the forming planets. Other smashed to pieces. As far as we know, of the earliest asteroids which formed a metal core, Vesta is the only one to survive in something close to its ancient form. Psyche survived as a metal core only. All others are gone. It was a real-life game of thrones run without mercy, and based on accidents, coincidences – and dumb luck. 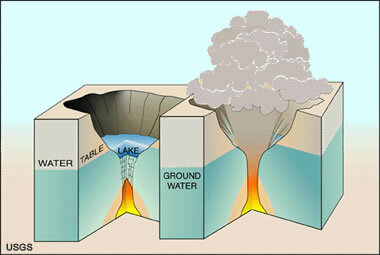 A volcano can be defined as the transfer of molten material to the surface. (It is also sometimes used for the transfer of the molten iron to the core, which is more like an anti-volcano.) That process must have happened on Vesta, as the surface became basaltic. In the traditional model, the mantle ocean fed huge effusive events, which for want of a better name we could call the Vesta traps. (I made this name up – you read it here first.) The basaltic flows would be many kilometers thick, and became the origin of the achondrites. Chondritic material still carries the imprint of their formation. Achondrites have lost this; they are made from the oldest metamorphosed matter in the solar system. These eruptions must have been an amazing sight! But the model of a magma ocean underneath a solid crust is not universally accepted. The alternative model is much more like Earth: pockets of melt which over time do the same thing. The question is how well an asteroid conducts heat. If the conductivity (or thermal diffusivity) is high, the interior will stay a bit cooler, and less can melt. The conductivity is determined by the top layer. If this is solid rock, it will conduct heat a bit better. If instead it is broken up by the rain of impacts, it insulates much better. Whether the interior melts depends on the top few kilometers of the asteroid. There is a bit of self control: if the interior is heating up because of a porous surface layer, magma may form and fill the holes. This will improve the heat conduction, and thus cool the interior. In this way, you could get intermittent melting. The heat conductivity may be different across the surface, depending on where the most recent impact has been. Models suggest that once molten rock collects at 10 kilometer depth within an asteroid, it can open fractures and dikes and reach the surface within months to years. If it can’t break through, it may also collect in sills just below the surface. This gives us a model without a magma ocean, but with pockets of melt heading upward towards the surface. In other words, we expect volcanoes. But there are limits to this process. The magma needs enough pressure to keep the dikes open. For small asteroids, the melt rates are too low for this. For continuous magma transport, the asteroid needs to have a radius of around 250 km or more, otherwise the transport becomes episodic. That is just about the radius of Vesta. So Vesta could have supported a continuous flood basalt, at least until the Al-26 ran out. A smaller asteroid would have to do with an occasional eruption. In asteroids with a radius less than 100 km, the cooling is too fast, and any magma chamber will solidify before it can collect enough to produce a large eruption. Above 100 kilometer radius, the cooling is slower and significant magma chambers could build up. In large asteroids, the magma pressure can allow peak eruption rates of 100-300 m3/s (300 m3/s is typical for a Kilauea eruption). In smaller asteroids, that would not be possible and so they could only have very small eruptions. Because of the lack of atmospheric pressure, even a very small amount of gas would cause asteroidal volcanic eruptions to be explosive. Typical eruption speeds are predicted to be 50-100 m/s, which is still below the escape velocity of a large asteroid but not by very much. The pyroclastic ejecta would cover most of the surface of the asteroid. If the asteroid is less than 100 km in diameter, the ejecta would escape, and such asteroids could not build up a basaltic surface. Eventually the eruption would form a fire fountain, the lava would pond and form long flows which bury much of the surface. Such primordial Vestal volcanoes did not survive, sadly. The subsequent bombardment has removed Vesta’s entire top layer, including any volcanic vents. What we are left with are sills, which now reach the surface and form the oldest and most heavily cratered surfaces on Vesta. In the south, the two mega impacts excavated deeper and also caused new metamorphosis, so there the composition is a bit different. How does this relate to the HEDs? The eucrites are expected to trace the old lava. The diogenite is from the deeper crust. The majority of the surface of Vesta seems to be similar to the howardites, a mix between the two. Diogenite is found mainly in Rheasilvia, but even there it is in a mix that is similar to howardite. This shows that the Rheasilvia impact dug deep into the crust and exposed (or rather, destroyed) the old sills. Eucrite is seen only at at the oldest, heavily cratered surface of Vesta. The oldest surface has kept a memory of the old eruptions, but everywhere else, the material on the surface has been thoroughly mixed up. Rheasilvia, and its older sibling, can indeed be responsible for all three families of the HED achondrites, excavated at different depths. But there is no HED or surface material from the olivine-rich mantle: even Rheasilvia did not frack that deep. To get to there, and find out whether or not there ever was an underground magma ocean, we will need to drill ourselves. Drilling went beyond the purpose of Dawn. The final surprise Dawn found was hydrogen. One of its instruments detected measurable quantities on the surface, mainly on the oldest terrain. It is likely in the form of hydrocarbons. But Vesta was not expected to have that: these things are volatile and would have been driven off during the days when much of Vesta was molten, when the asteroid differentiated. The fact that it is seen only on the oldest terrain suggests it was deposited on the surface very early on, perhaps shortly after the days of the volcanic flood basalts: we are seeing the remnants of a very early bombardments by other asteroids (chondrites) and perhaps by comets. That is not known anywhere else in the Solar System. It could only be seen on a differentiated body, which means either the planets or a few asteroids. The planets are geologically active and have lost all records of the earliest few hundred million years of their evolution. Vesta may be unique in having kept a trace of the events of the solar system’s dark ages. In conclusion, Vesta seems the only survivor of the early days of the solar system, the planetesimals that formed the first planets. It also hosted the oldest volcanic eruptions that we know about. The spacecraft that came to have a look had the right name. It found a window into the formation of the solar system. But there was limited time. After one year, it had to leave. The ion engine was re-engaged, and the Dawn probe left for its other target, Ceres. The window opened only briefly. Maybe next time, we can land. It would be a wonder to have a rover with a drill, surveying the oldest volcanic surface of the solar system. We may even find where the megablock that created the Nordlingen Ries came from. NASA, please? Update: originally the story said that the Nordrnger Ries is the largest impact crater in Russia. It appears that this title is help by the Puchezh-Katunki crater, 40 km across (or more), in Russia. The text has been updated to fix this. I think we may have had an event from the web cam. USGS says 2 3.9 at 22:05 and 07. At 22:10 lots more dust. Looking at this it starts around 12:04, the first 3.9 was 1.5km very close to HVO. Second one was shallow -.7km but way over on the other side. At 12:10 ish you see a big dust cloud from the cliff on the other side. Have not see a quake for that if there was one. The 12:10 does look larger on the Seismograph, still not showing on the list. All Times HST. 5.3 is already showing for the 22:10 event, very quick I thought they were waiting for the signals to arrive in the states? The caldera is pretty deep now, its going to have some pretty impressive eruptions in it with all of those cliffs, 400+ meter tall lava falls… I saw that really good documentary about the 1959 eruption, and how the early stages had lava flowing down the side, I imagine something similar happening here pretty soon, certainly within the next 10 years at the 0.2 km3/year supply rate it has now. ah, finally the reason the water table was mentioned becomes obvious – it is not per se for the current eruption, but that the caldera will automatically end up with a lake affecting future eruptions if it drops below that line. thank you 🙂 though I guess a lake might for swiftly and thereby affect the current eruption too ? Very small risk that water table may seep through and interact with magma in sufficient enough quantity to create an explosion but very unlikely. On the flip when magma finally returns to summit and it pressurizes again then higher probability if a lake is present that the twain shall meet in sufficient quantity to create a more energetic event. Actually after looking at it, there is a lot of similarities between the current eruption on ambae and the 1790 eruption on kilauea. Ambae hasn’t had a flank eruption and has (slightly) more viscous lava, but the progress of the initial eruption is about how I interpret the 1790 kilauea summit eruption to have gone. 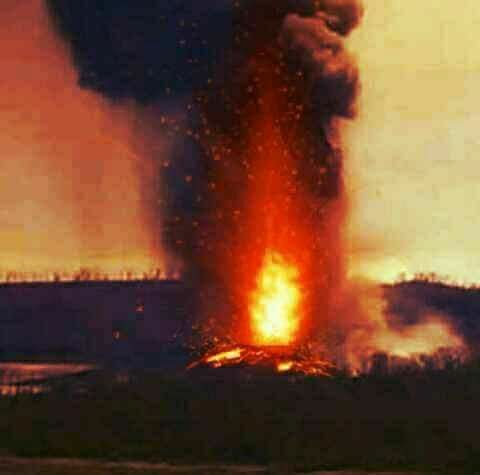 It started relatively effusively and built an island, with initial eruptions forming an island, but then it rapidly intensified making huge lava fountains probably over 500 meters tall. These fountains are not like the small lava fountains from the current kilauea eruptions early days, they are more like a continuous strombolian eruption, and do not generate large lava flows making them technically not effusive. Many of the eruptions on mt etna are like this (particularly 1997-2002 and 2015), as was the eruption of villarica in march 2015, the big eruption of izu oshima in 1986, and a few of the kilauea iki 1959 fountains. If you have seen any of my other comments then you have probably seen me call these ultrastrombolian eruptions, because they are rather different from ‘normal’ hawaiian eruptions. After this water got into the vent and since then it has been very explosive subplinian activity like the main 1790 eruption from kilauea, the one that created the footprints ash, though a notable difference is that kilauea in 1790 recovered back to magmatic eruptions quickly. I actually wouldnt be surprised if ambaes ongoing eruption qualifies as a VEI 4 now, the cinder cone it has created is something like 300 meters high and has consumed 3/4 of lake voui. And the answer to the puzzle image: it was the east siberian arctic. I live on a small island (160k inhabitants) which is experience a tourist boom in the last years due to low cost air fares, hotels, rent a cars, tourist activities are opening like popcorns in a microwave. Most of what we offer is volcanic related, but some volcanic systems experienced volcanic unrest (failed eruptions) in the last decades, other is expected to erupt in the next decades (both capable of vei 4/5), but even a small basaltic eruption will scare away those tourists. Will be catastrophic economically for the island. Just over 11 days to launch. By the way – GeoLurking are you OK? You’ve been a bit quiet. Mostly okay. Just not much to say. The ongoing conversation of turtlebirdman, thedustdevil and others has been quite entertaining. ..oh, and I found out that an ex girl-friend was prosecuted for felony child endangerment. Sort of counting my blessings that the relationship fell apart 40 years ago. That falls into that whole statistical weirdness that I mentioned a few days ago. In this specific case, what seemed like the end of the world to me at the time, turned out to be quite a good thing for me and my sanity. No, the singer “kaRIN” has nothing to do with this story. However the album title… seems to apply. here’s a little ditty that has been going around my head…. And then when there is nothing left…. Some of those bubble bursts are pretty tall, I dont think much lava has actually landed outside the crater for a few weeks now but it seems to be frequent in this video. It looks like the lava lakes on ambrym. I expect this has been on here before, but I’ve just been watching it and it’s very interesting. Especially about tilt measurements.